Baskit Kumar aged 20 and Monnu Kumar aged 21 are friends. They live in BARH. They both were unemployed and wanted to start business but no one was there to help them reach the goal. They both joined in local youth group (Ambedkar Yuva Manch) formed by BDVS. As per their request and need, the youth group helped them with Rs-20000/. 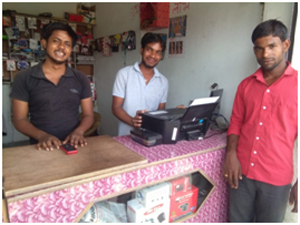 BDVS gave Rs 10000/- to both of them to start a communication centre (mobile recharging and mobile repairing shop). Today they both are earning Rs- 600/ to Rs -800/ everyday. Though this amount is not enough to fulfill their daily needs of their respective families still they are managing with that earning. They said “Issi paisa se humlog padhai-likai karte hai aur ghar me bhi madat karte hai” With these money we study and also help in our homes. They both are satisfied with their earning and are happy that they are able to fulfil the needs of the people of their village. Now villagers don’t need to go far for the mobile recharge or for the mobile repairing.